Rebuilding after California’s deadly wildfires could cost up to $13 billion, and taxpayers can also expect a big bill for fighting this year’s massive blazes. Wildfires engulfed more than 246,000 acres and killed at least 80 people. Fire insurance premiums will likely increase for those living in fire-prone areas, including those areas scarred by ongoing conflagrations. Financial services company CoreLogic estimated the two biggest fires — the Camp Fire and the Woolsey Fire — did about $8.6 billion worth of damage, based on the reconstruction value of the homes and structures that went up in flames. The modeling firm RMS put the insurance industry’s wildfire burden between $9 billion and $13 billion, which includes “damage to buildings, possessions and vehicles, business interruption and additional living expenses for those affected,” the Financial Times reported. The Camp Fire did the lion’s share of damage, destroying more than 12,000 buildings as it engulfed 150,000 acres. At least 80 people were killed by the blaze and about 1,200 people are still unaccounted for by authorities. 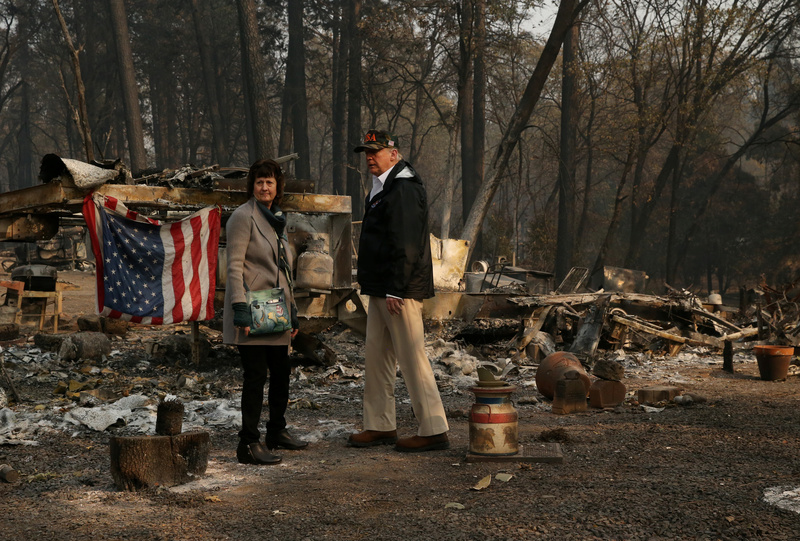 U.S. President Donald Trump visits the Skyway Villa Mobile Home and RV Park, a neighborhood destroyed by the camp fire with Mayor Jody Jones in Paradise, California, U.S., November 17, 2018. REUTERS/ Leah Millis. High insurance company payouts to rebuild burnt communities will have spillover effects. Fire insurance premiums will likely increase for those living in fire-prone areas, including those areas scarred by ongoing conflagrations. For example, northern Californians living, or looking to move into, areas scarred by the Tubbs Fire in 2017 are seeing a “slow creep” upwards in insurance premiums, E&E News reported. Insurance providers have refused to cover some homeowners in high-risk areas. Other homeowners are upgrading their fire insurance. California fires cost $16 billion last year, mostly from wildfires. It was the costliest year for California in terms of wildfire damage, with more than 1.3 million acres burned. The Tubbs fire, the second most destructive in state history, burned just 38,000-acres, but killed 22 people and destroyed more than 5,600 buildings in parts of northern California’s wine country. 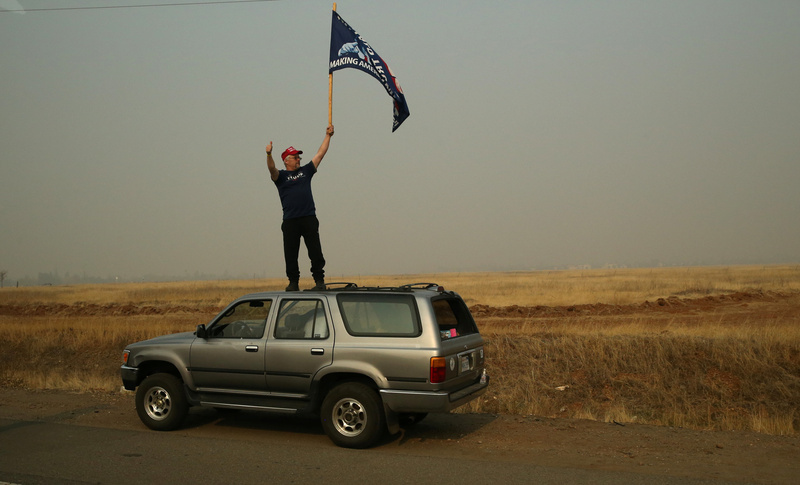 A man waves a Trump flag as the motorcade of U.S. President Donald Trump flies by after Trump visited a neighborhood recently destroyed by the Camp fire in Paradise, California, U.S., November 17, 2018. REUTERS/ Leah Millis. Last year’s devastating fires are also putting upward pressure on ratepayers. That’s because state regulators determined power lines and equipment owned by utility PG&E caused 12 northern California fires in 2017. Faced with billions of dollars in legal liability, Democratic Gov. Jerry Brown signed legislation in August to allow PG&E to bill ratepayers for wildfire costs. While the causes of the fires are not yet determined, PG&E reported sparks coming from one of its power lines just before the Camp Fire began. However, California’s top utility regulator signaled Thursday he was laying the groundwork for a PG&E bailout using the law Brown signed in August. That means ratepayers could see even higher costs if PG&E is held liable for the current fires. There’s also the cost to federal and state taxpayers for fighting the fires, which at this time is unknown. What’s known is that California exhausted its $448 million firefighting budget in September fighting fires over the summer. The federal government spent nearly $3 billion fighting wildfires across the country in 2017.